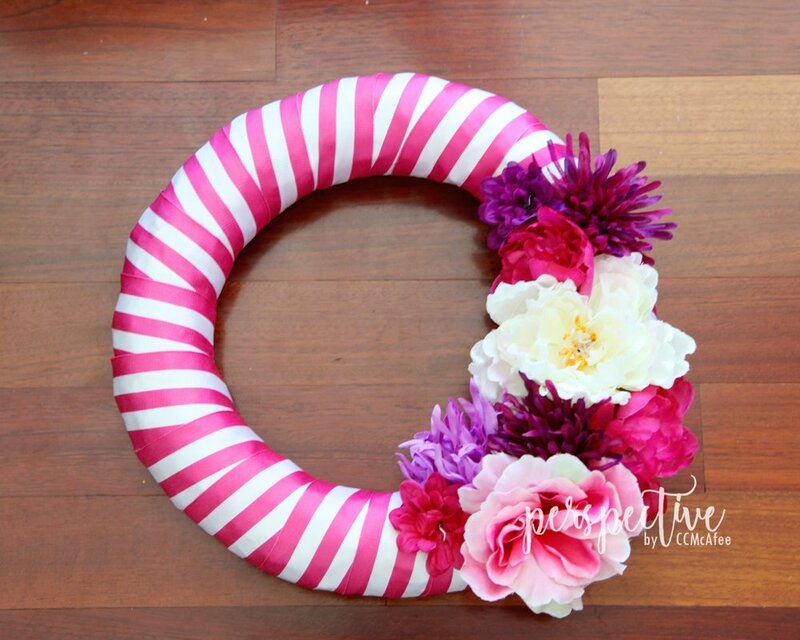 How cute is this wreath!!! I love it. Last year I created two of these wreaths, picutred below, to hang outside. I wanted to change them up this year, they have faded a bit, I want something a little brighter. I stripped them both down to start over again. This is a simple project to do. I used straw wreaths, ribbon and dollar store flowers I had on hand. I also used U pins to attach the flowers to the wreath. 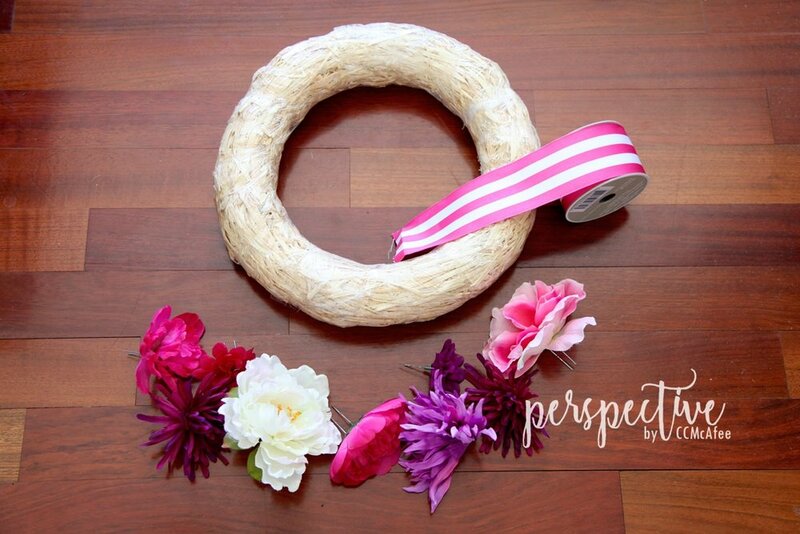 You can get the wreaths at any craft store. This ribbon I found at Michaels, and I love it! All I did was wrap the wreath with ribbon. I pinned the ribbon to the back side of the wreath and started wrapping. I used two spools to cover the wreath. 6 yards. (with enough left over to hang the wreath with). To attach the flowers I first removed their stems. Most of them had a hole for the stem, which went through to the top of the flower. If that wasn't the case I just removed the plastic from the flower and pushed the u pin through. I arranged the flowers beginning with the largest where I wanted it, then clumped the rest of the flowers in. I used the smaller flowers as filler between the larger flowers. I hung the wreath with the remaining ribbon. What do you think? Certainly easy enough to replicate! I have made two. I will hang them outside. I've been waiting for the snow to at least melt! 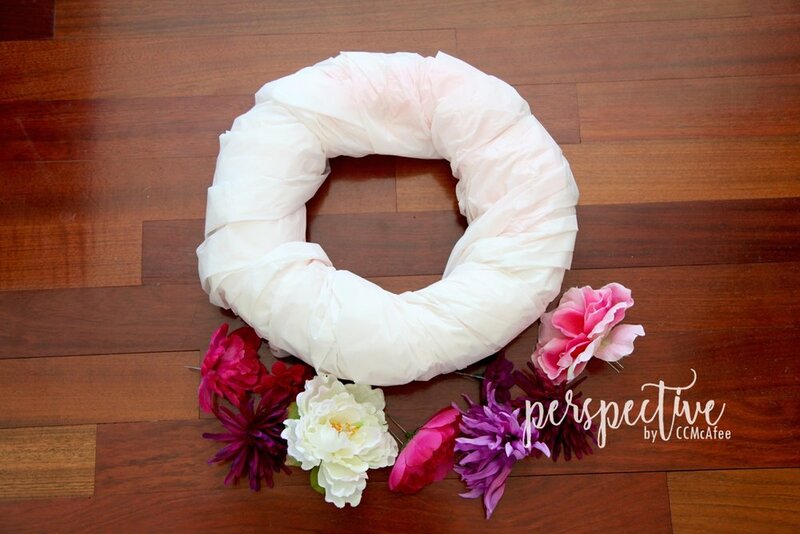 How ridiculous would these spring wreaths look with snow all over my porch? We are finally about there.